Skitch is one of the most popular productivity apps, both on mobile and the desktop, for a reason: it makes it easy to snap, mark up and share just about anything, like PDFs. 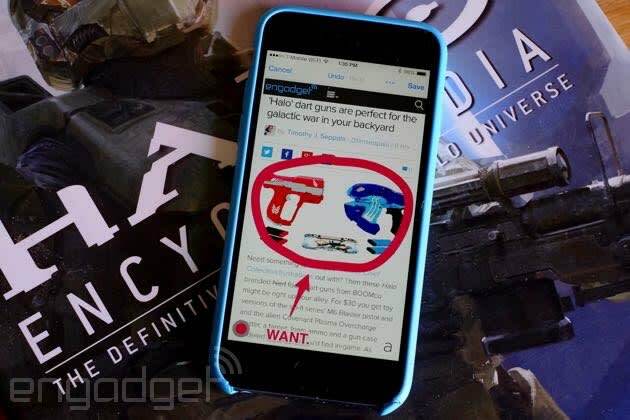 If you've been using it on iOS, there's now a reason to like the application even more. Thanks to a new version, released earlier today, you can use Skitch to annotate web pages within Safari, eliminating the need to manually capture a screenshot and then having to open up the app. To install you simply have to tap the Share button while in the browser and add Skitch as part of your actions, which will then let you see it next to Copy, Print and others. It's basically an extension, so think of it as a way to save you a few taps whenever you're trying to express something important -- as shown by the example above.